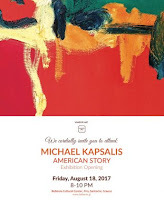 The art exhibition "American Story" by Michalis Kapsalis open today. His canvases depict his love for the sea and for travelling, as he was a man of the world: from his birthplace in Berlin to Athens and New York where he lived. The opening takes place at 20.00 at the Bellonio Cultural Center in Fira and the exhibition is open to the public until 23 August, daily from 10.30 to 13.00 and from 18.30 to 22.00. Free entrance.